On the occasion of a weekend’s afternoon walk the other day, we came across wild hop -those lovely light green umbels that are used to flavor beer. It was such and unexpected sight that I couldn’t help but to have a little harvest, and I instantly thought of deep-frying the umbels like zucchini flowers. My dear darling was quite amused about this idea and proposed pudding instead, and he was even more amused when I took this for granted and proclaimed: Pannacotta! Back home, I did some research on hop, and I found out, that in Bavaria, the young sprouts are a regional delicacy comparable to asparagus. Now you know where you will find me next spring – crawling around some Berlin Mitte hedges to cut hop asparagus in public… Regarding the use of umbels, I found just recipes where it gets cooked for molasses and teas, for example. Then I stumbled upon the advice, that the consumption and even just the cropping of hop umbels could cause allergic reactions. I’m a timid person when it comes to allergies, but I’m also very curious when there are new culinary adventures ahead. So I decided upon a compromise: no heavily hop-infused pannacotta and no deep-fried whole umbels. But a batter flavored with just some leaves might do a good job, both in taste as in health – as many batter recipes use beer anyway, it seemed worth a try. Well – two days after, I have neither spots in the face nor a deaf tongue ;-). And how about the culinary aspect? I liked it a lot, and it’s really exciting to get a taste of beer without beer (although I’m well aware that half of mankind will consider me a fool for liking this ;-)). I don’t like just the flavor but also the umbel’s look, and as I re-started some experiments in black & white food photography in some of the last posts, I make the following monochrome shot my contribution to Cinzias and Susans wonderful 100 weeks jubilée edition of Black and White Wednesday. Congratulations to both of them! I have taken part in this lovely weekly event once a long time ago and then somehow forgot about b&w food photography for whatever reason. Indeed, I appreciate a lot Susan’s and Cinzia’s commitment to an underrated aesthetic approach to both ingredient’s and dishe’s shots which – in my opionion – is worth a try. 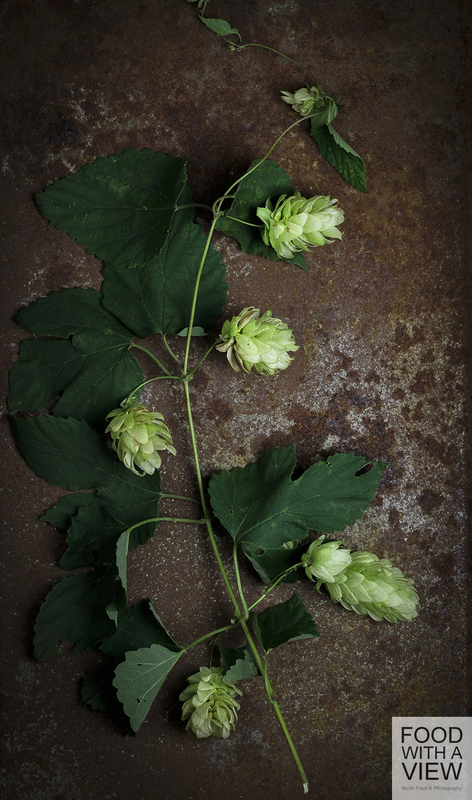 Wash the hop umbels thoroughly and pick off the leaves. Dry well with paper towels. Mix together the remaining ingredients for the batter and add the hop leaves. Let rest for 15 minutes to infuse. Mix the ingredients for the dip and put the dip aside. Heat the deep-frying oil in a deep pot. 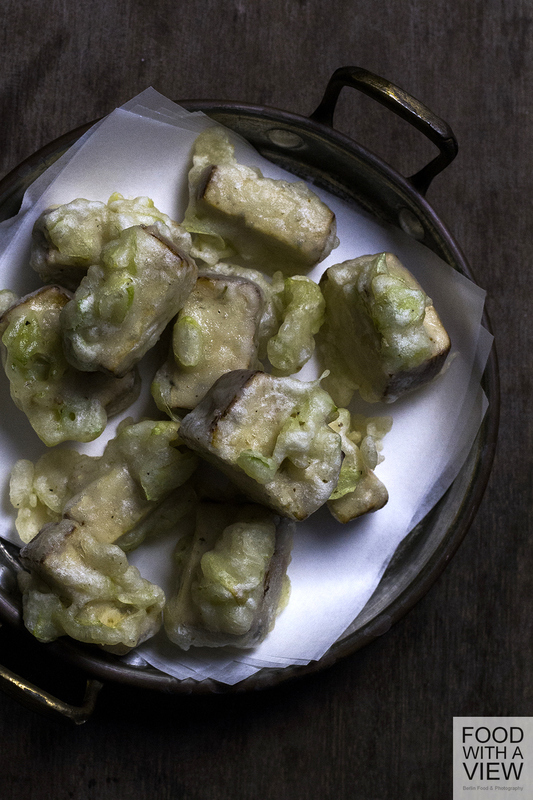 Fold the tofu cubes and physalis into the hop-batter and take off again so that all pieces are thinly covered with it and deep-fry the pieces for about 1-2 minutes. When slightly colored and crisp, take off with a skimmer and let drain the excess oil on paper towels. Serve with the dip. Kürzlich bei einem Spaziergang begegnet uns wilder Hopfen, und zu den Segnungen des Blogger-Daseins gehört natürlich, dass man an so etwas nicht einfach mit einem „Schau mal, wie hübsch“ vorbeigehen kann. Ich war für Frittieren, mein Liebster für Pudding. Eine kurze Recherche förderte unter anderem die Warnung zutage, dass man auf Hopfendolden allergisch reagieren kann, und wenn ich dergleichen lese, schlottern mir sofort die Knie. Die Neugier war aber größer, und so gab es statt ganzer Dolden oder hopfensatter Pannacotta halt einen Ausbackteig mit Hopfenblättern und innen Tofu und Obst. Hat ganz ohne Bier prima nach Bier geschmeckt. Wobei die meisten Menschen wohl Biergeschmack mit Bier vorziehen würden ;-). Die Hopfendolden sehr gründlich unter fließendem Wasser waschen. Die Blätter abzupfen und mit Küchenkrepp trocknen. Zutaten für den Ausbackteig mischen und die Hopfenblätter zufügen. Für 15 Minuten ruhen lassen. Die Zutaten für den Dip verrühren. Das Öl in einem tiefen Tof erhitzen. Tofu und Physalis durch den Teig ziehen und im heißen fett 1,5-2 Minuten frittieren. Mit einem Schaumlöffel herausnehmen und überschüssiges Öl auf Küchenkrepp abtropfen lassen. Mit dem Dip servieren. Thank you so much for the beautiful photo compliment! However, I’m so sorry that the recipe doesn’t explain. Thanks a lot for giving me that hint, I tried to reformulate some steps a bit clearer and I hope that it works better now :-). Thanks a lot for your beautiful comment, dear Laura! You are right, it’s a bit crunchy and full of flavour. I wish you much luck on the hop hunting – love that expression ;-). Mir wäre es im Traum nicht eingefallen, dass man Hopfen ganz normal essen kann. Und Biergeschmack ohne Bier? Du forderst meine Imaginationskraft ganz schön heraus. Finde ich klasse. Deine Fotos sind immer zum Niederknien. Och Mensch, wieso kommst Du damit erst jetzt. Wir waren am Wochenende auf Kloster Andechs – es gab Hallertauer Hopfenbäuerinnen mitsamt Hopfendolden. Ich gestehe, ich habe keine mitgenommen, was für eine Tragödie…..
Oh Susanne, das ist ja super aergerlich! Fuer das Rezept brauchst du nur ganz wenige Dolden, vielleicht begegnen dir ja auf dem naechsten Spaziergang ein paar Pflaenzchen. Viel Glueck! Also Wahnsinn, auf was für Ideen Du immer kommst, ich bin begeistert! Hopfenspargel kenn ich, hab ich aber noch nie probiert, der ist ja ein wenig schwieriger zu bekommen. Dafür hätt ich eine Stelle, an der ich schonmal wilden Hopfen wachsen gesehen habe, mal sehen, ob ich da noch was finde, oder ist es jetzt schon zu kalt? Ich wünsch Dir schöne Tage auf der Buchmesse! Oh, das freut mich sehr, liebe Julia! Tatsaechlich weiss ich gar nicht, wo man Hopfen kaufen koennte, aber vielleicht begegnen dir ein paar wilde Pflanzen (sie scheinen sich gern um Hecken und Buesche zu schlingen). Viel Glueck! Und auf die Messe morgen freue ich mich schon sehr :-). Claudia, did not know you could deep fry hop umbels, I have always used them for decoration or making flowered garlands. We also collect them in the countryside, and the old ladies go for the young sprouts in Springtime, they then make a faboulous risotto! Thank you for stopping by and commenting, Cinzia :-)! It was big fun to take part in BWW. 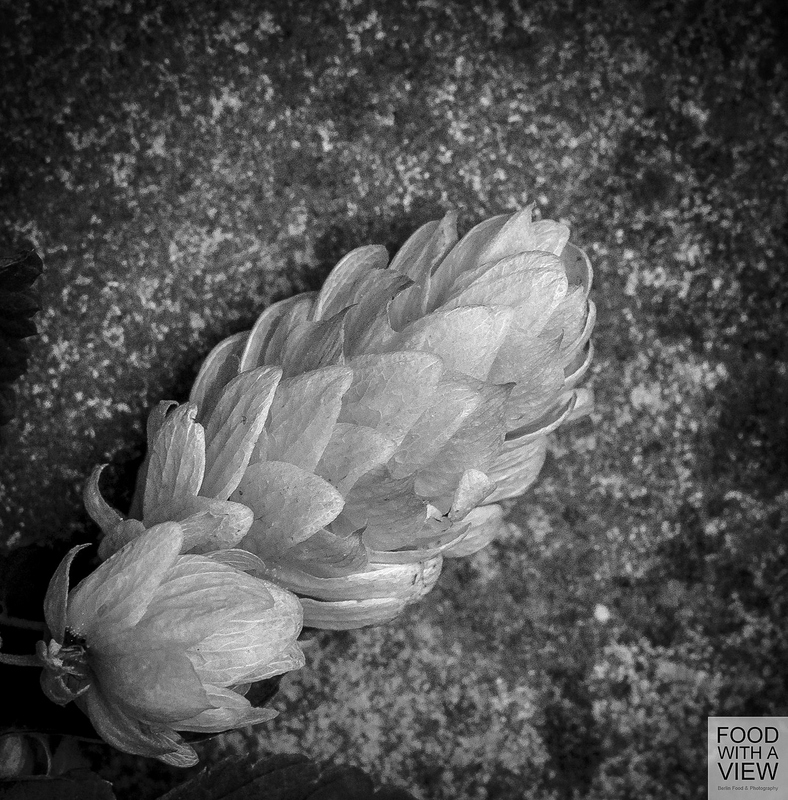 – I have heard about the young sprouts, too, in Bavaria it’s offered as hop asparagus. Indeed, I don’t know if the umbels could be deep-fried as a whole. But with just the leaves in the batter covering something else like described in the recipe, it works very well and adds a fine bitter beer flavor. Beautiful images, all of them. I see fresh hops once or twice a year at our local farmers’ market, and admired them, but didn’t know quite what to do with them, so thanks for all the information. Thank you for stopping by, Simona! Great that I know your blog now, too. 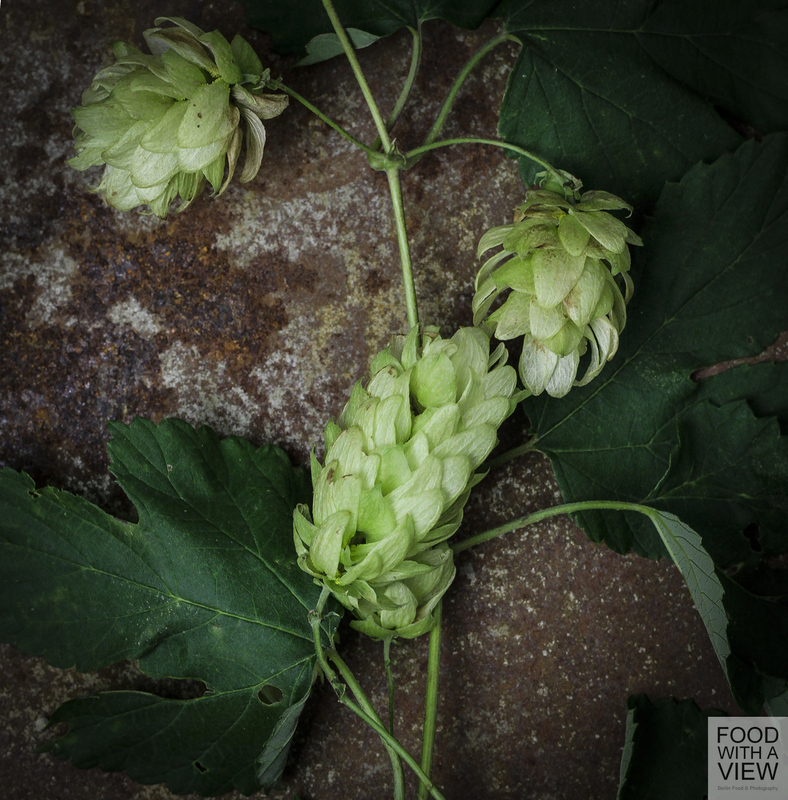 I’m happy that you like the idea, the pics and the infos – and lucky you that you get hop on local markets: unfortunately, I never spotted hop over here on markets.